The family of murdered Belfast solicitor Pat Finucane have walked out of today’s meeting with David Cameron. At the meeting Cameron had told the family the British Government would not hold an Inquiry into his murder. As she left Downing Street his wife Geraldine told reporters she was almost too angry to speak. 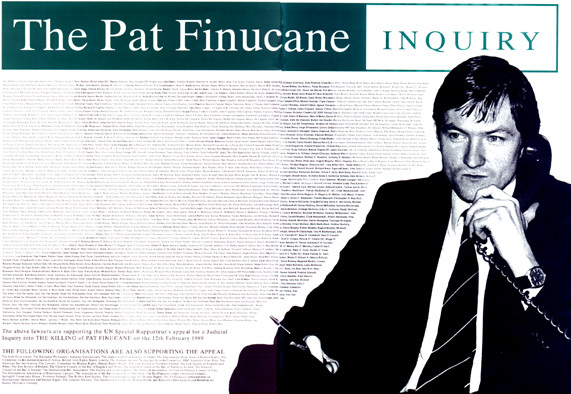 Pat Finucane was a Human Rights lawyer who had been successful in several cases against the British Government when he was shot dead in front of his wife and children on February 1989 by a pro-British death squad. His family has campaigned ever since for an Inquiry that would establish the truth behind the state’s collusion in his murder. Three weeks before his murder junior Home Office Minister Douglas Hogg told the House of Commons that some solicitors were ‘unduly sympathetic to cause of the IRA’ in a move widely seen as giving state backing to his murder. Earlier this year Wikileaks released US Embassy cables quoting former Irish PM Bertie Ahern as telling US officials ‘Everyone knows the UK were involved’. They also showed US officials feared ‘elements in the security-legal establishments’ in Britain were fighting against any Inquiry. Now despite calls from far and near for an Inquiry the British Government have instead decided to continue the cover up.